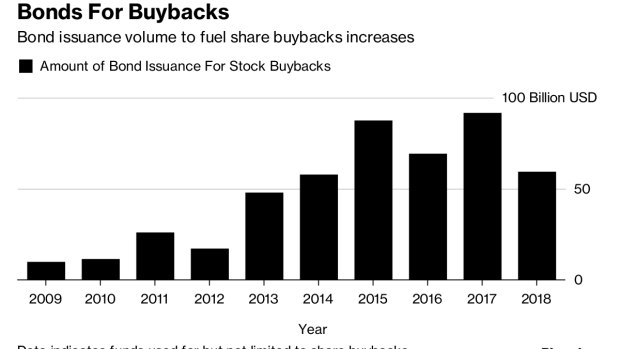 (Bloomberg) -- Equity investors can count on an increase in debt-funded share buybacks this year to help send U.S. stocks to record highs, according to a strategist at Canaccord Genuity. Brian Reynolds says strong demand for corporate bonds and attractive valuations after the fourth-quarter rout in equities will encourage companies to take on debt and use the proceeds to reward shareholders or pursue mergers and acquisitions. He predicts buybacks will increase for a seventh straight year, even as the effect of tax cuts that fueled last year’s record bout of repurchases fades away. “The equity bull market is likely going to continue to be powered by debt-fueled buybacks and M&A activity,” Reynolds wrote in a report this week. If Reynolds is right, the debt-funded buybacks could be a boon to U.S. stock investors confronting the possibility that the S&P 500 Index’s longest-ever bull market is coming to an end amid slower corporate earnings growth and a trade war that could damp global growth. Repurchases have ballooned in recent years, with corporate appetite for shares the biggest source of demand for U.S. stocks. Thanks to a profit boost from tax cuts, announced buybacks surged almost 60 percent last year alone, according to Birinyi Associates, exceeding $1 trillion for the first time since the firm began tracking the data in 1984. Two bond deals this week back the Canaccord thesis. Fox Corp. and Charter Communications issued $6.8 billion and $2 billion respectively to pay a dividend and buy back shares. Both deals were well received by investors. Reynolds’s call stands in contrast to forecasts from analysts such as David Kostin at Goldman Sachs last year and Jeremy Hale at Citigroup more recently, who say there will be less funding for buybacks this year. “As QE is wound down, a big driver of the low volume world of recent years (i.e. the QE induced, debt fueled, corporate bid to equity markets) is also fading,” Hale wrote in a note Thursday. Skeptics such as Neil Sutherland, a money manager at Schroder Investment Management, say overleveraged companies are likely to pare back debt issuance this year. A Bank of America survey released in January showed corporate indebtedness concerns among fund managers remain at a 10-year high. But Reynolds says soaring demand for bonds from public pension funds will keep interest rates suppressed and encourage new sales. The funds account for over three-quarters of the $4.8 trillion increase the asset class has seen since the end of the financial crisis. Reynolds expects equities to rise as corporations take advantage of this demand and take on debt to boost stock prices. “There will be record amounts of money available for companies this year (and likely in the next few years as well) to attempt to get their stock prices back up to their long-term trends,” Reynolds wrote. --With assistance from Lu Wang, Natalya Doris, Brian Smith and Luke Kawa.